A retired San Francisco detective suffering from acrophobia investigates the strange activities of an old friend’s much-younger wife, all the while becoming dangerously obsessed with her. BEFORE: Horror week begins today with the Alfred Hitchcock classic, Vertigo. While perhaps not as famous as Hitchcock’s Psycho, this film is still well-known and a camera effect is even named after this film (see: Dolly Zoom under Alternative names). My film production class actually watched and analyzed the opening scene of Vertigo earlier this year, but this is the first time I’m watching the film in it’s entirety, coincidentally, for another class. AFTER: Turns out Vertigo is more of a mystery rather than a horror film, but I’m still counting this as the beginning of horror week. That being said, there is a lot of room for improvement over the next several days. Hitchcock is known as the Master of Suspense and that is very true. The first Hitchcock film I saw, Dial M For Murder had me on the edge of my seat from the start. With Rear Window, it takes some time to buildup, but the end is just as suspenseful. So it’s with much disappointment that I must say Vertigo does not live up to the “Master of Suspense” title. It just was not present for the most part. There was minor setup in the beginning followed by an investigation that led almost nowhere until the very end when there was a slight twist. 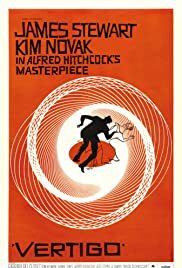 Just looking at it as a standalone and not comparing it to any of Hitchcock’s other films, there is a severe lack of pacing and structure in Vertigo. Even the suspenseful parts in the very beginning and end were not that suspenseful. The film brought about more laughs than adrenaline rushes which I found very surprising. Maybe Hitchcock intended Vertigo to be more of a comedy than his other films; I don’t know. It still doesn’t change the fact Vertigo suffers from a lack of pacing. There are some silver linings scattered throughout and it’s not a film that you’ll fall asleep to. It’s just lower on the entertainment scale, especially when compared to Hitchcock’s other works. Of the three I’ve seen, I recommend Dial M For Murder the most. Go see that one instead.